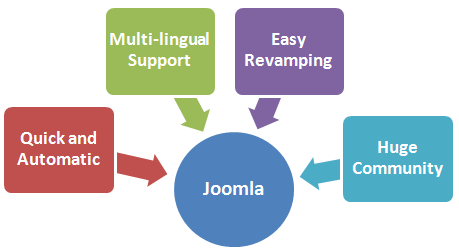 Joomla is an open source platform on which Web sites and applications can be created. It is a content management system (CMS) which connects your site to a MySQLi, MySQL, or PostgreSQL database in order to make content management and delivery easier on both the site manager and visitor. Joomla is a completely free open source solution available to anyone and everyone with a desire to build dynamic and robust sites for a variety of purposes. Joomla has been utilized by some of the Web's most recognizable brands including Harvard, iHop, and MTV. It is capable of carrying out tasks ranging from corporate websites and blogs to social networks and e-commerce. In order to go live, you need hosting for your site. Joomla is easy to install on almost any web server with PHP and MySQL and there are many hosts who claim to support Joomla. Few providers however, provide the quality of service you will find at SteGround.com and the dedicated support that will walk you through the setup and later management of your Joomla. Learn more about our Joomla hosting offer. M1 Logix Technologies agreed to help our non-profit organization update and brand our existing website.We do not like to express our appreciation for M1 Logix who quickly design our website. M1 logix responded to our request accurately and met our need in a very short period of time. Thank You! We were very impressed from the first conversation. The level of experience and thought and care that went into our project was amazing! We highly recommend anyone looking for the best customer experience and professional designs. We feel that in this business we let the work do the talking and the portfolio and ethics of M1 Logix clearly speaks for itself. M1 Logix Technologies was very friendly and professional & knowledgeable. They worked with me for long time on my project, making all of the changes that i requested until it was absolutely perfect. They were very patient took the time to make sure i understood project they created. I would absolutely hire them again and would definitely recommend them. Thank you very much M1 Logix. I am really happy with your service, it is exceptional, M1 Logix Technologies is just great. When i have a question they answer it at once, they have more than an outstanding customer service. After having a bad experience with my old Web Designer company, I would say that M1 Logix Technologies people are very professional and their knowledge is incredible, they also solve problems very fast, I am impressed. I recommend M1 Logix to all my customers, friends and clients. Thank you for your patience and your great job. M1 Logix Technologies. is a professional website design & development company based . M1 Logix Technologies is a trusted global IT Services company that offers services in the area of software product engineering, enterprise mobility solutions, enterprise content management solutions and customer relationship management solutions. Our goal is to deliver ‘value for money’ services to the customers. Our premium quality software helps in building commercial-grade and enterprise-strength software. We have extensive experience in IT.